The Rabbit Zippity Two-StepCorkscrew is an essential tool for any home bar or kitchen. The corkscrew of choice for waiters and sommeliers, this opener is comfortable and easy to use. A two-step operation uses the bottle as a leverage point to remove corks quickly and easily. The corkscrew folds together for ease of transportation and storage. Features a built-in foil cutter for added convenience. Designed to work on any size bottle. 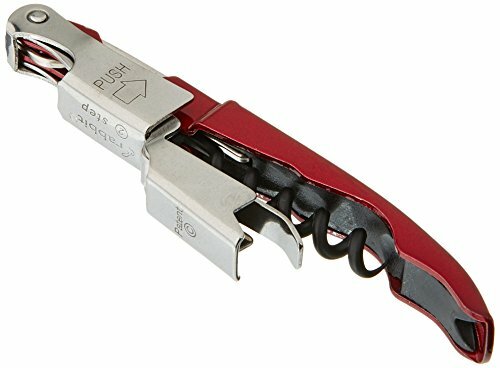 The corkscrew of choice for waiters and sommeliers, this opener is comfortable and easy to use. A two-step operation uses the bottle as a leverage point to remove corks quickly and easily. The corkscrew folds together for ease of transportation and storage. Designed to work on any size bottle. If you have any questions about this product by Metrokane, contact us by completing and submitting the form below. If you are looking for a specif part number, please include it with your message.